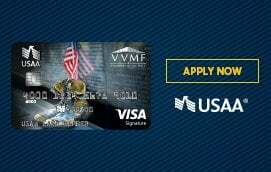 The Vietnam Veterans Memorial Fund wanted, above all, for the memorial to have a prominent site in a large, park-like area; thus, the western end of Constitution Gardens was requested as the site. Subsequently, VVMF set four major criteria for the design: (1) that it be reflective and contemplative in character, (2) that it harmonize with its surroundings, especially the neighboring national memorials, (3) that it contain the names of all who died or remain missing, and (4) that it make no political statement about the war. Watch this video about the design of The Wall and learn about the arrangement of names. 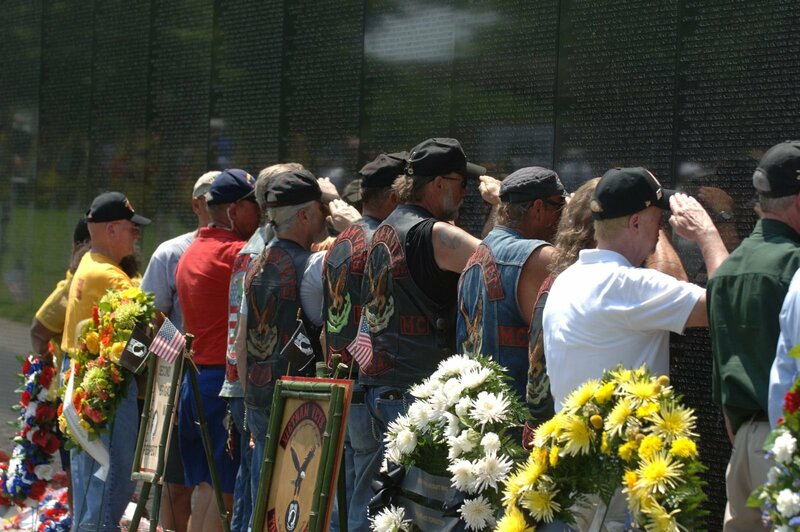 (Top of The Wall) IN HONOR OF THE MEN AND WOMEN OF THE ARMED FORCES OF THE UNITED STATES WHO SERVED IN THE VIETNAM WAR. 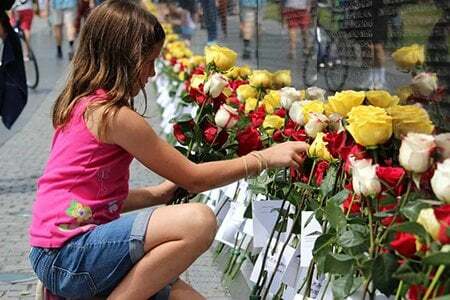 THE NAMES OF THOSE WHO GAVE THEIR LIVES AND OF THOSE WHO REMAIN MISSING ARE INSCRIBED IN THE ORDER THEY WERE TAKEN FROM US. 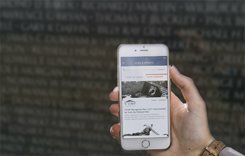 A key element to the design of the Vietnam Veterans Memorial is the names of the men and women who died while serving with the U.S. armed forces in the Vietnam War. There are more than 58,000 names inscribed on the black granite Memorial. The list of names begins at the vertex of the walls below the year of the first casualty and continues to the end of the east wall. It resumes at the tip of the west wall, ending at the vertex, above the year of the last death. With the meeting of the beginning and ending, a major epoch in American history is signified. Each of the walls is composed of 70 separate inscribed panels. The largest panels have 137 lines of names; the shortest have one line. There is an average of five names per line. Each panel is numbered from "1" to "70" at the base, with West Panel 1 and East Panel 1 meeting at the vertex, leading out to East or West Panel 70. The names of the first casualties appear on the top of East Panel 1 below the date "1959." 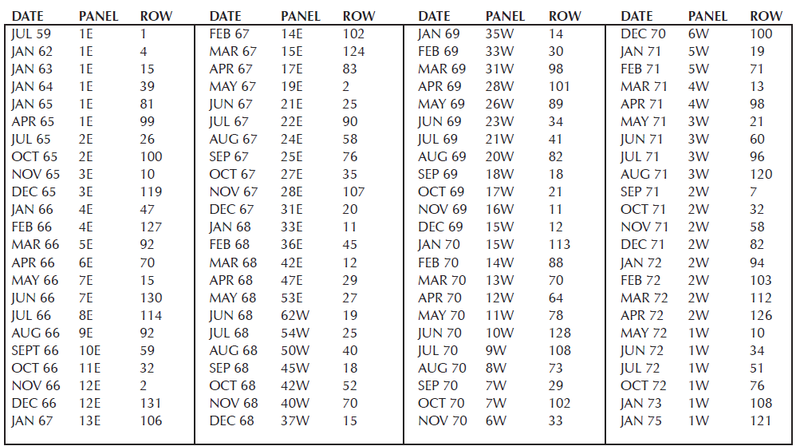 The chronological listing by casualty date of the names proceeds left to right, line by line, down each panel, and then to the top line of the panel to its right, as though the panels were pages in a book, until East Panel 70, whereupon the sequence of names begins on West Panel 70, proceeding to West Panel 1 at the vertex. The last casualties are listed on the bottom line of West Panel 1 above the date "1975." Each name is preceded (on the West Wall) or followed (on the East Wall) by a symbol designating status. ◆ The diamond symbol denotes that the service member's death was confirmed. + Those whose names are designated by the cross symbol were in missing or prisoner status at the end of the war and remain missing and unaccounted for. In the event a serviceman's remains are returned or he is otherwise accounted for, the diamond symbol is superimposed over the cross. (+) If a man returns alive, a circle, as a symbol of life, will be inscribed around the cross. No such cases have occurred though some men have been found to be alive with their names on The Wall due to clerical errors. To put a circle around their names would not give a correct historical context to the symbols. These names are and have been removed from periodic revisions of the printed Directory of Names.